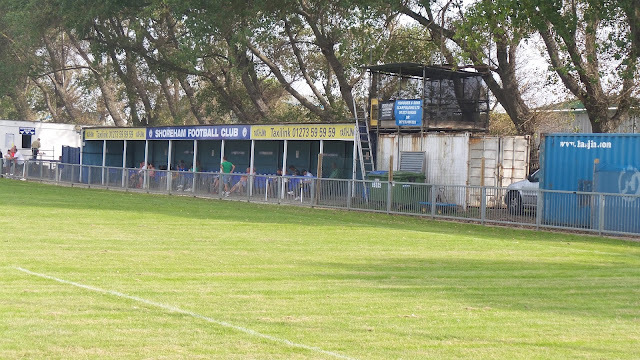 Shoreham FC was founded in 1892. Their nickname is the Musselmen owing to the local fishing industry. They started out in local leagues such as the West Sussex Football League and the Brighton, Hove and District League. 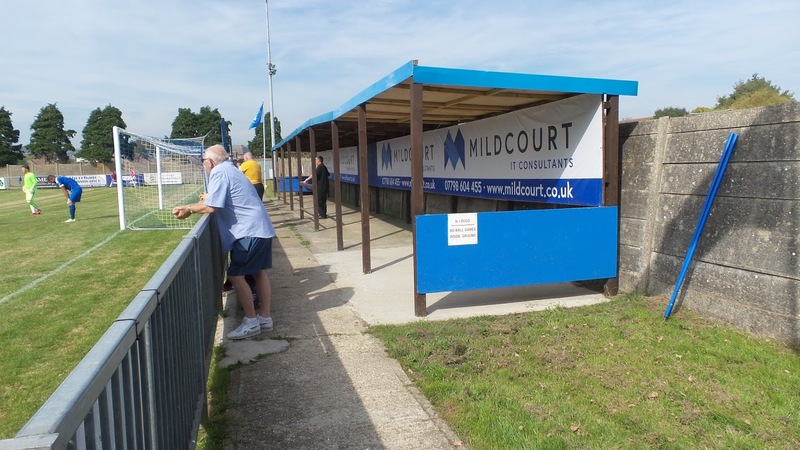 In 1920 they became founder members of the Sussex County Football League. Aside from a brief break from 1927 - 1932 when they dropped down to the Brighton League and between 1939 - 1945 due to the outbreak of war, they remained here until the end of last season. 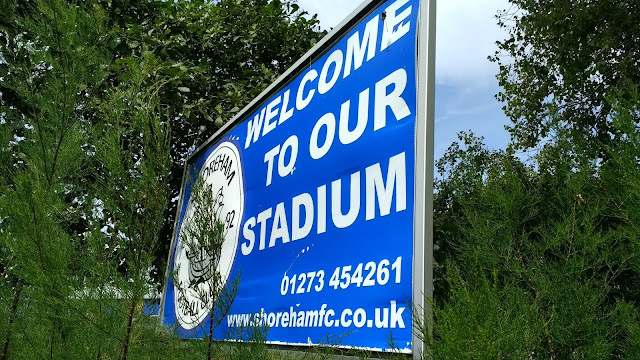 They were champions in the last season of the league being a singular division in 1952, a far cry from the 1926/27 season when they gained just five points all season and finished bottom. They also won the league the following season, as it expanded to a two-tier system. For the most part, they remained in the top tier, with the most disappointing season coming in 1984 when they finished second-bottom of Division 2. 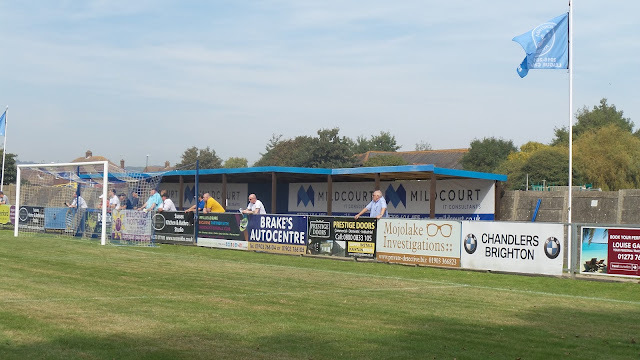 Following promotion from Division 2 in 2005 when they finished third behind Crowborough Athletic and Wick, they remained in the top tier until they were champions for the 4th time last season, a marked improvement as they finished in the top half for the first time in seven seasons. 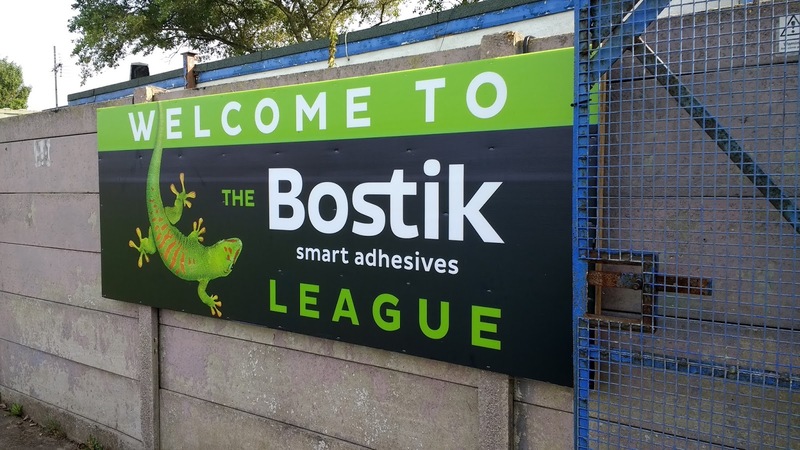 This time they took the promotion to the Isthmian D1 South but have had a tough start, sitting bottom of the table and without a point from their first three games. 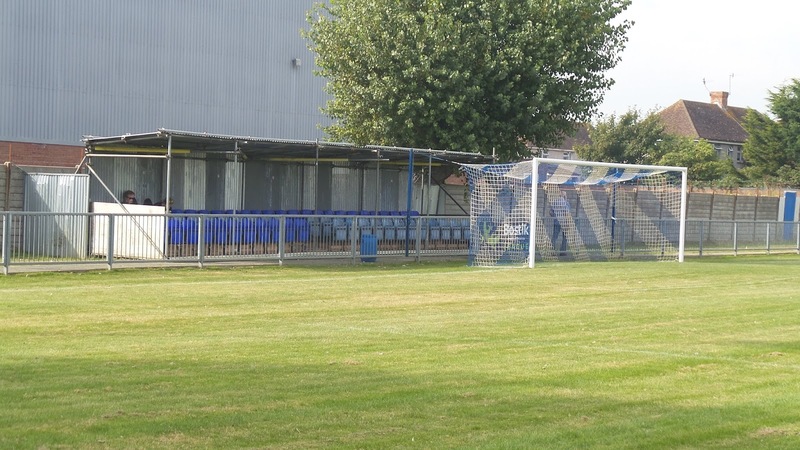 In the FA Cup the club's best ever run has been to the 2nd Qualifying Round and that came during the 1994-95 season. 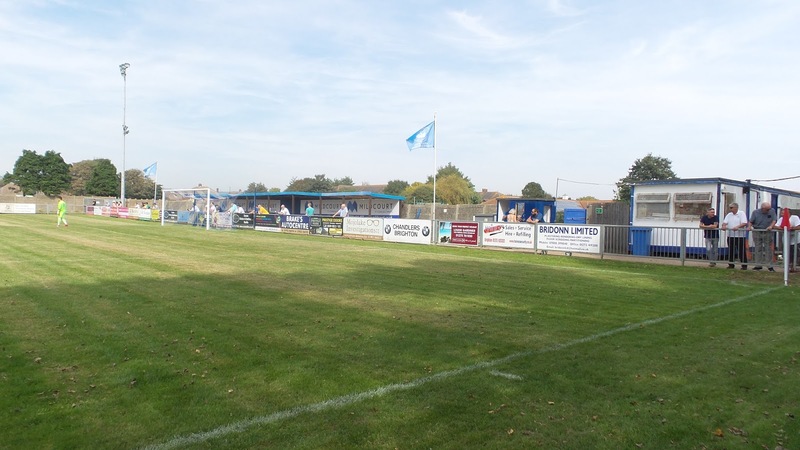 After beating Ringmer and Ramsgate, they lost narrowly 1-0 at Chertsey Town. In the FA Vase, their best progress has been to the 3rd Round - losing to Tunbridge Wells in 1975/76, Stamco in 1994/95, Stanway Rovers in 2008/09 and Shortwood United in 2008/09. 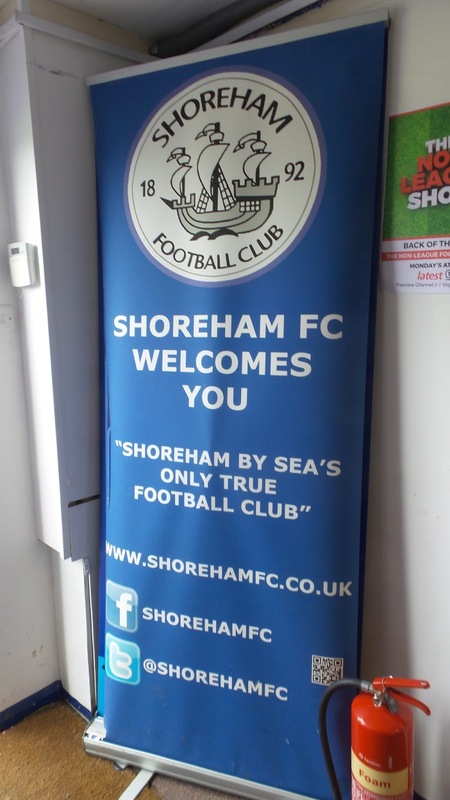 Locally they have won the John O'Hara League Cup on five occasions, the Sussex Senior Cup twice, the Sussex Royal Ulster Rifles Cup twice and the Sussex League Floodlit Cup in 1994 when they beat current Conference South side Whitehawk 3-2 in the final at Lancing FC. 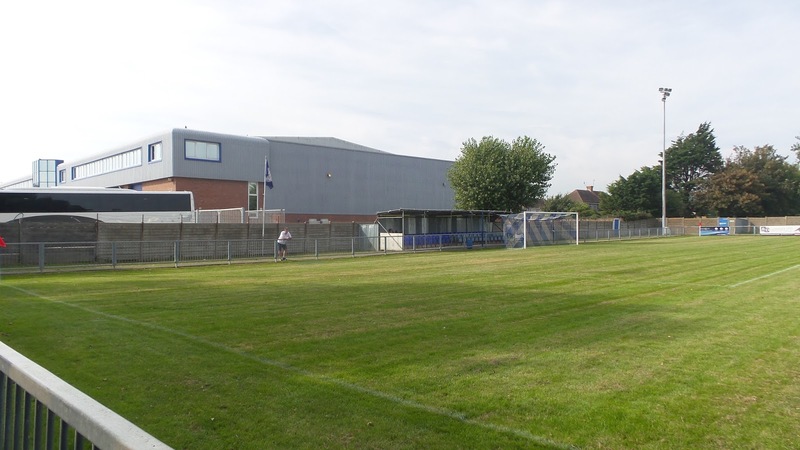 Originally on this day, I had been planning a Bank Holiday double of Darlington Railway Athletic and Darlington, with the latter being one that I'd wanted to visit for ages and the former having an 11 am kick-off. Even when fellow hopper Chris pulled out due to other commitments, I was willing to make the more than 500 mile round trip on my own, such was the attractiveness of getting them both done on the same day. However, Darlington RA (or their opponents Northallerton Town) decided that the 11 am kick off was too early for them and I and many other hoppers, one of whom had come all the way from Norway and booked a non-refundable hotel. It was hard to see why RA had looked a gift horse in the mouth, with no doubt that they would have significantly boosted their attendance with the original plan. I had to seek an alternative and although there were plenty of morning kickoffs, afternoon games were a bit scarce. 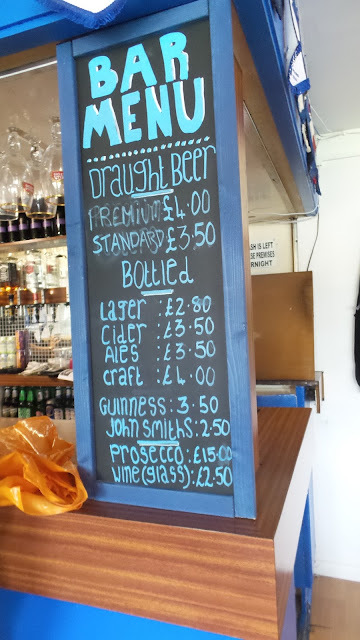 I eventually opted for Shoreham's clash with Cray Wanderers, having looked at the choice of pre-match refreshment options. 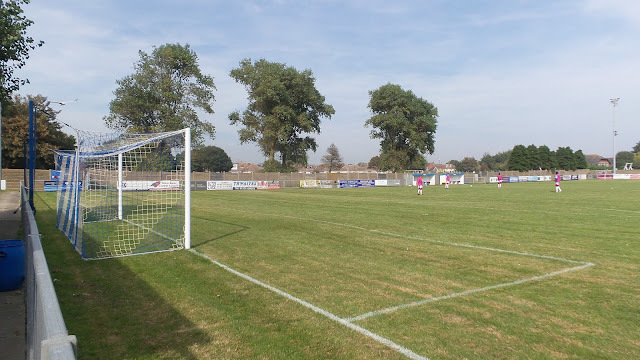 I left my game at Southwick at 12.50 with it taking 10 minutes to get to Shoreham's ground. I was lucky that I was able to turn left at a level crossing as it was very busy. 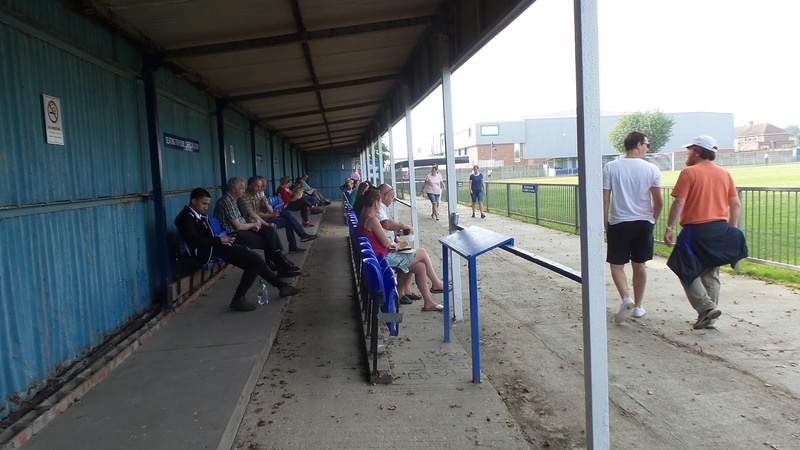 I was parked up at the ground by 1 and after going in to get a programme, I walked into town. The brilliant Old Star Micropub had a cider festival on and with 26 on offer, there were plenty of opportunities for new tries and I was able to sample four thirds before heading back to the game. For the second time that day I was stuck at the level crossing as a foot passenger, surely at such a busy junction, you'd have thought a bridge was in order, but obviously not. 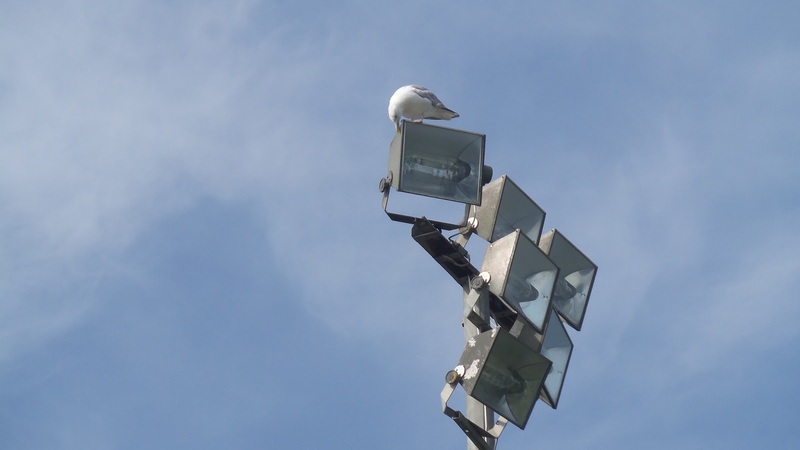 I had to wait a pathetic ten minutes for the crossing to go through its machinations and as a result got back to the ground just before kick off. Google Maps has sent me to a dead end, so I had to go back on myself and go to the player's entrance. I rang the number on the gate and someone let me in. After going to the turnstile and paying, I went to the tea bar and got some chips. 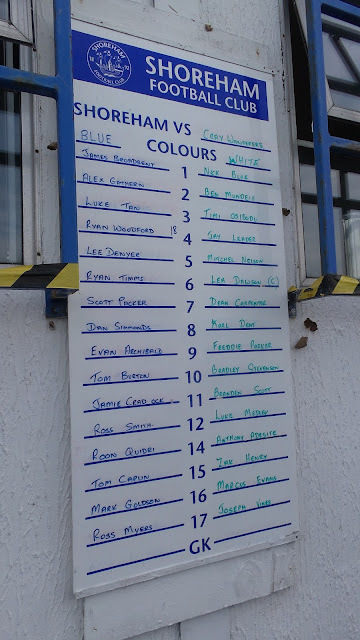 The game started with Cray Wanderers on top in their smart away kit. They took the lead with a drilled shot from the edge of the area by Bradley Stevenson on 22 minutes. 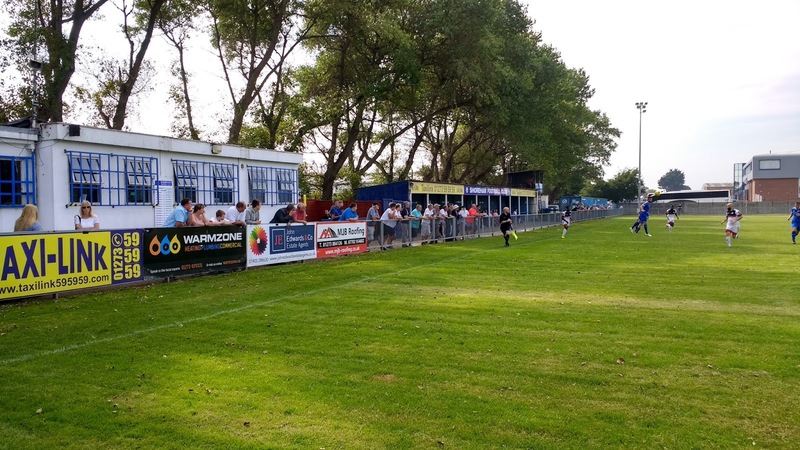 Ten minutes before half time, the same player made it two with a smart finish from the edge of the six-yard box. 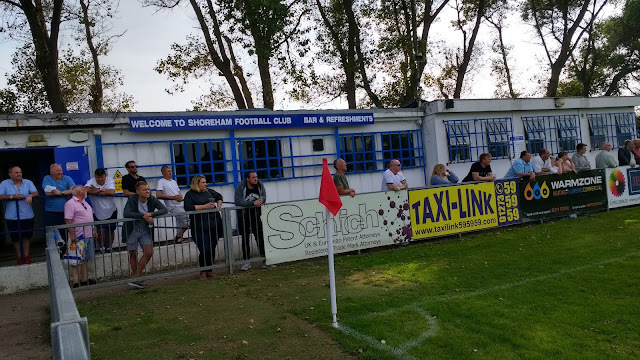 It stayed that way at the break and despite the occasional chance on the break for Shoreham, Cray were well on top. 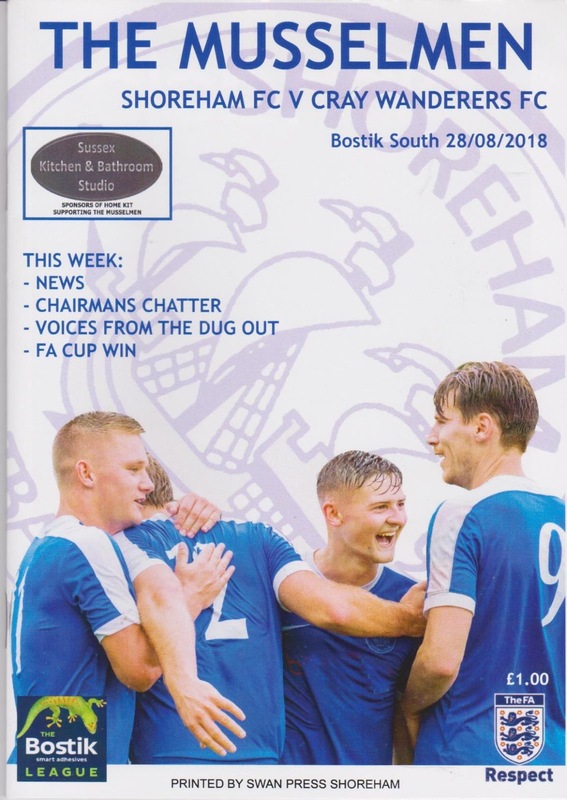 They extended their lead to 3-0 just before on 52 minutes when the ball was worked into the area and Lee Denyer deflected the ball into his own net. That was it as far as the scoring went, sadly, the hosts looked way off the pace and barely had a shot. THE TAXI LINK COMMUNITY STADIUM is a three sided ground with the far side closed off to spectators. 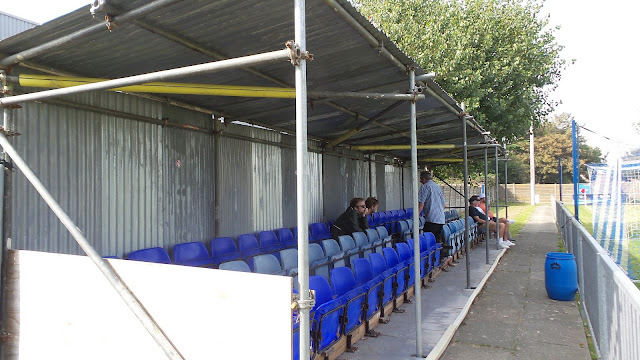 On the other three sides, it has small areas of cover, two seated and one standing. 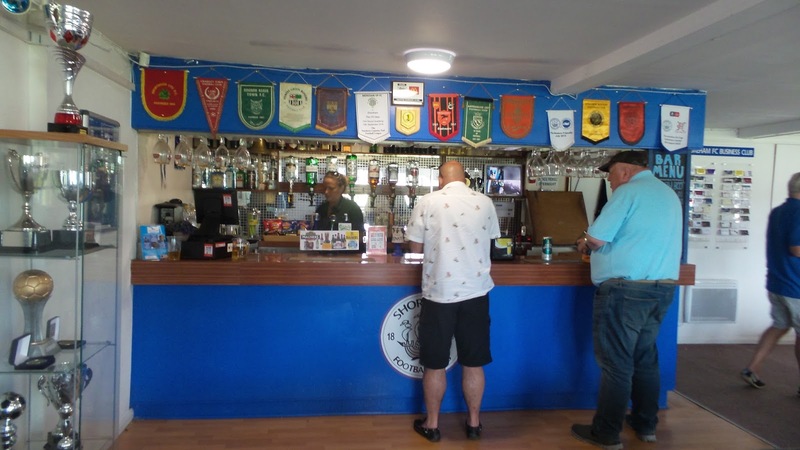 Overall there is capacity for around 300 of each, with a total capacity of around 2000. 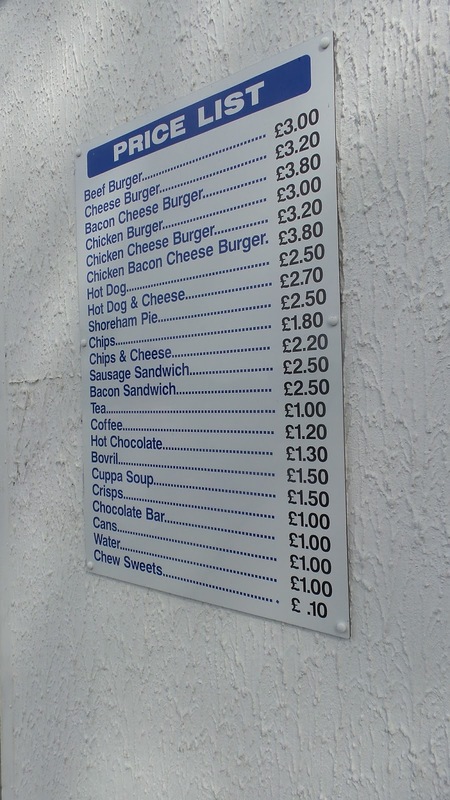 There's a decent tea bar at the ground, with a decent range at sensible prices. The bar does its job but it's nothing special, whilst I didn't see a club shop. The location is a bit of a mixed bag with the proper entrance being a pain to find in amongst a sprawling industrial estate. Luckily there is a number on the player's entrance gate for someone to let you in and take you round to the turnstile to pay. 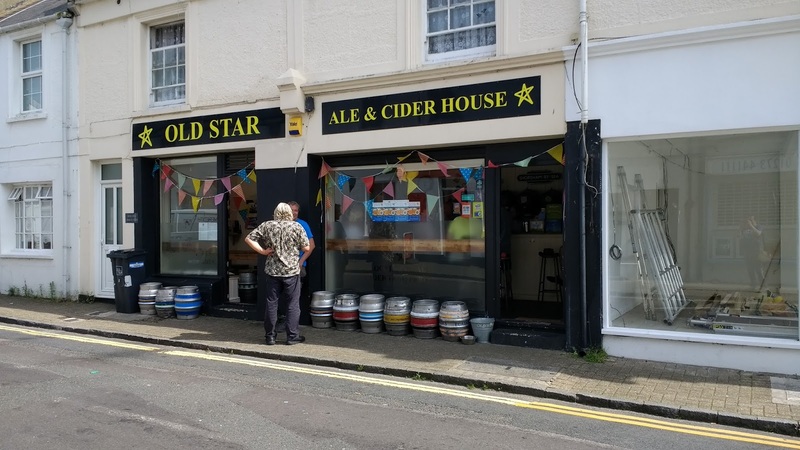 It's only a 20-minute walk from a very nice town with the Old Star Micropub being excellent and a range of other outlets.